A butter tart is a Canadian specialty that, unless you have friends or family living up North, you may never have experienced. I’ve certainly never seen them sold in any bakery around here. 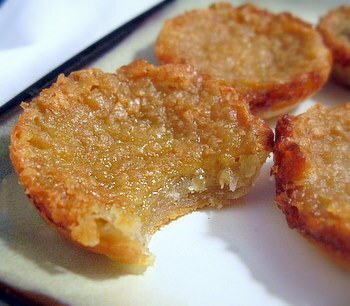 The pastries are made with a tart shell that is filled with a mixture of sugar and butter, held together with eggs. Often, the tart filling includes raisins or chopped nuts, but a plain tart is pretty standard – and pretty darn tasty, too. The closest way I can think of to describe the overall texture of the tart is to say that it is a little bit like a pecan pie without the pecans. But that really only emcompasses a small part (the sweetness) of the tart. The filling is gooey and buttery, almost slick with a melt-in-your-mouth texture and just the right amount of caramely sweetness from the sugar. It is held together with a hint of flaky crispness from the pastry crust. The tarts are light, but rich, and it seems prudent to make them small so that you can enjoy a few bites at a time. I baked mine in a standard muffin pan, which worked out perfectly and didn’t require me to pull out a set of miniature tart pans. This recipe turns out a very tasty butter tart. Many recipes call for the filling to be made with corn syrup (sometimes lots of corn syrup), but mine starts with brown sugar. I added a little bit of maple syrup for an extra hint of flavor, and made sure to include a pinch of salt to take the edge off the sweetness of the filling. Since I made two dozen, I made half with raisins and half without. The amount of raisins given below is approximate; just sprinkle a few raisins into each tart shell to suit your tastes. Since the raisins take up some of the filling space in the shells, you might get two or three fewer tarts if you omit them entirely, so keep that in mind. I used my pate brisee recipe to make the crust. One recipe makes enough dough for two dozen small tarts. Roll out chilled pate brisee base on a lightly floured surface until it is about 1/8-inch thick. Use a 3.5- or 4-inch round cookie cutter (a fluted cookie cutter will give you a nice edge, if you have it) to cut out 24 rounds from the dough. Place each round into a muffin cup on a standard muffin tin and press down lightly to make sure the crust goes into the corners. In a large bowl, cream together brown sugar and butter. When light and fluffy, beat in eggs, vinegar, maple syrup, vanilla extract and salt until smooth. Divide raisins into tart shells and top each with a generous spoonful of filling to cover the raisins and reach the top of the crust. Bake for 18-22 minutes, or until filling is golden and the edges of the crust are lightly browned. Remove from pan and cool on a wire rack. Serve warm, at room temperature or cold (if you have completely cooled them before storing in the fridge). Next PostNext Crepes, Waffles, And Pancakes! I consider myself to be a butter tart expert – and I live in Ontario! A great tip is to add frozen bluberries to the tart shell before you pour in the filling. These are absolutely amazing…try it, you’ll be addicted! Those look seriously tasty. I think you’d like the british treacle tarts if you like them, I must make them sometime!! I have a great friend from Canada, it would be wonderfull to make them for her for a suprise! Thanks for the good idea!!! I’m a former Yank who has lived in Canada for nearly four decades. Butter tarts and Nanaimo Bars are two “all Canuck” desserts … both sweeter than sweet. High caloric content. Butter tarts are much like “pecan pie without the pecans” to some people. But every family has their own recipe they swear is the best. Some are far too sweet; others too gooey. I like mine sans nuts, but with golden currants (raisins). Canucks can cook more than moose. When I was little my best friend’s grandma used to make something similar that she called “sugar pies”- from the times we helped bake them I remember the filling being mostly sugar, butter, brown sugar and eggs. She topped them with piles and piles of whipped cream, which of course, only added to its sugary-fatty goodness! mmm. i am definitely bookmarking this recipe. these sound so simple and yet SO delicious. i’ll probably make them without the raisins, but plain or with nuts sounds fabulous. THANK YOU. That looks so delicious! I’ve been searching for a recipe for a British tart – a custard tart – as talked about on As Time Goes By, one of my favorite Britcoms. 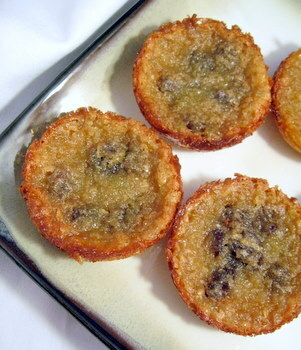 I’ll definitely try this butter tart recipe as well! Sounds great. Yum! I must eat these! When I saw the title, “butter tarts” on my feed reader, I had to click through. I think doing tiny tarts was a good choice…they look like a nice alternative to cookies for dessert. These look absolutely decadent! I’m about an hour from the border in Grand Forks, ND, and while we tend to see a lot of Canadian recipes as a result I have yet to see these. I’m anxious to give them a whirl. Seriously they area Canadian thing!?! I never knew that. We go through dozens of these at Christmas time in our house. They area favorite of my Dad’s. Those look really good! They remind me of the ones that my grandmother used to make. She made them with chopped walnuts and raisins. And these definitely call for some good quality butter. How about another Canadian thing, Beavertails has anyone tried them?. Theyn are similar to fashnachs with different coatings. They can be baked or deep fried. looks almost like chess pie which is popular in alabama. yum. Nanaimo bars were actually made in US as New York slice long before they were renamed Nanaimo bars and made Canadian. My dad used to eat these all the time! I’d never tried making them, but since I now live very far from Canada, thought I’d test the recipe out and give my kids a bit of their Canadian heritage. They loved them! Amazing! I’m Canadian and didn’t realize butter tarts were a Canadian thing. Lost my recipe the night before xmas and found this one. Beter than my original. Love the hint of maple.